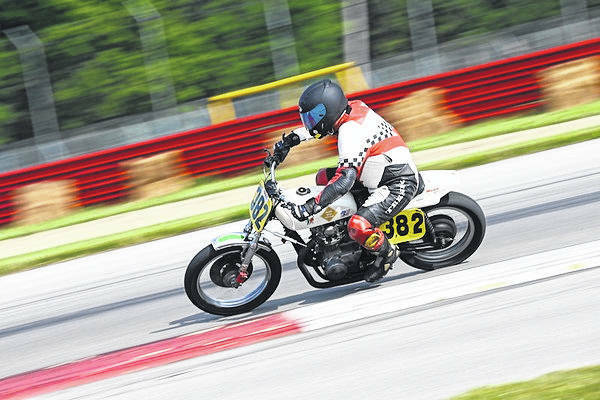 LEXINGTON — Mid-Ohio Sports Car Course hosts the return of the American Motorcyclist Association’s (AMA) Vintage Motorcycle Days for the 24th consecutive year July 6-8. AMA Vintage Motorcycle Days, one of the country’s largest annual gatherings of motorcyclists, enthusiasts, vendors and collectors, celebrates motorcycling and racing past and present. It’s all for a great cause serving as a fundraiser for the AMA Hall of Fame Museum, a non-profit organization that works to preserve the tradition of motorcycling in the United States. The weekend will include multiple forms of racing disciplines, including road racing on the 2.4-mile, 15 turn Mid-Ohio road course, hare scrambles, motocross, pit bikes and trials happening on the surrounding natural terrain. Flat track racing will be held at the nearby Ashland County Fairgrounds. Along with the racing that will occur throughout the weekend, attendees can be entertained through live music, vendors, a swap meet and other attractions, such as the American Motor Drome Wall of Death. Motorcycle owners can also take part in the “Lap for History” around the race track during the lunch break each day with a donation to the AMA Hall of Fame Museum. Ticket prices for the event are $60 for the weekend, $40 for admission on Friday or Saturday and $35 for Sunday. Children 12 and under are free when accompanied by a ticketed adult at all events at Mid-Ohio Sports Car Course. Garage paddock access is open to the public for free during AMA Vintage Motorcycle Days. Motorhome and tent spaces are available for purchase. Tickets can be purchased in advance either by calling 419-884-8400 during business hours, 8:30 a.m. to 5 p.m., or by visiting midohio.com/tickets. Visit www.amavintagemotorcycledays.com to read more about AMA Vintage Motorcycle Days. Follow the event on social media with #AMAVMD. For more information, visit midohio.com, or its Facebook page @MidOhioSportsCarCourse or follow updates on Twitter @Mid_Ohio and Instagram @officialmidohio.